slowly disintegrating as it orbits a white dwarf star. hints at the fate of the Solar System. The remnants of a destroyed planetary system have been seen orbiting and feeding a dead star - a fate that will probably befall our own Solar System. The finding confirms astronomers' theories about why many burnt-out stars called white dwarfs seem still to be accumulating material on their surfaces, even though any element heavier than helium should have sunk into the dense star's centre early in its formation. "I cannot overstate how cool this result is," says John Debes, an astronomer at the Space Telescope Science Institute in Baltimore, Maryland, who was not involved in the work. "For a long time, we've had a good hypothesis about how white dwarfs get dusty, but to directly observe planetesimals" - rocky objects the size of dwarf planets or smaller - "evaporating before our eyes is very exciting." A white dwarf forms when a relatively low-mass star, such as the Sun, runs out of fuel. After first expanding into a red giant and engulfing the inner planets (which in the Solar System will include Earth), the star sheds its outer layers to leave a small and very dense core. Heavy elements are pulled towards the centre of the dead star under its strong gravity. Yet for decades, analyses of light coming from white dwarfs have shown that the surfaces of some are rich with metals and other elements. To explain this puzzle, astronomers speculated that the stars might be feeding off the remains of outer planets and asteroids, which could have been kicked into the inner solar system during the white dwarf's turbulent formation and broken up by its intense gravity. Later sightings of disks of debris around a small fraction of white dwarfs backed up that theory. The study, published in Nature on 21 October1 (A Disintegrating Minor Planet Transiting a White Dwarf), is the first to see the process in action. The observation of disintegrating remnants of planets or asteroids also gives a glimpse of our own future, says Andrew Vanderburg, an astronomer at the Harvard-Smithsonian Center for Astrophysics in Cambridge, Massachusetts, and lead author of the study. "The situation is something that's likely to happen to our own Solar System," he says. The team studied WD 1145+017, a white dwarf in the Virgo constellation, around 175 parsecs (571 light years) from Earth. Using NASA's patched-up Kepler space telescope in its second mission, K2, they studied the light coming from the star and found that it dipped briefly roughly every 4.5 hours, as if obscured by a passing body. 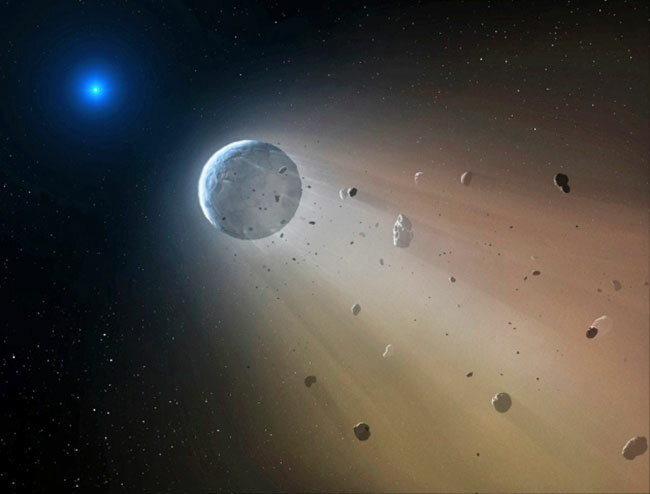 Follow-up studies using ground-based telescopes suggest that at least one, and probably six or more, small rocky bodies are orbiting the star, trailed by a dusty tail, the researchers say. Further analysis of light from the star shows evidence that elements on the white dwarf's surface include calcium, iron and aluminium, suggesting that the rocky bodies are disintegrating. The researchers estimate that 8 million kilograms of matter are being vaporized every second by the star's intense heat. Follow-up studies may allow astronomers to analyze the composition of each orbiting chunk and conduct an "autopsy" on whatever larger body they once came from, says Michael Jura, an astronomer at the University of California, Los Angeles. "With additional observations of this system, we can learn things like the size of the dust grains blocking the starlight, and what the rocky bodies are composed of," adds Vanderburg. "We can find out if the recipe for making planets in that solar system is different in any important ways from the recipe for making planets in our own Solar System."